Multi-terrain rollerskis give skiers the chance to experience a wider variety of terrain and go further afield in training. As well as tarmac, skiers can get a good workout on hard-packed dirt and gravel surfaces. They are available with brakes, which adds to their versatility. Multi-terrain rollerskiing has grown considerably in recent years, and there has been a great deal of innovation and development in creating new products. They are great for track cross-country skiers, but also increasingly backcountry and Alpine ski touring skiers. Powerslide produces X-Plorer skating rollerskis for use with conventional cross-country ski boots, and give a good balance between cross-country 'ski feel' and off-road ability. 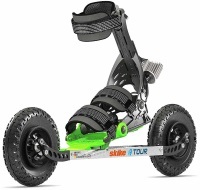 The Skike rollerskis offer exceptional versatility and off-road ability, and come with heavy duty brakes fitted as standard. The V07 and V9 models are used with your own shoes, so no need for ski boots; the R9 Nordic classic model is used with cross-country ski boots and bindings. Prices below include free delivery within the UK, EU, USA and Canada. New design with lighter 150mm wheels for more agile peformance on tarmac as well as hard packed dirt and gravel tracks. One-way ratchet wheels fitted. New combi multi-terrain roller skis. 150mm wheels are lighter and offer a slightly smoother ride. Heel lift for better classic technique. New combi multi-terrain roller skis. 200mm wheels allow you to tackle rougher and more gnarly tracks. Heel lift for better classic technique. Skating multi-terrain rollerski. 150mm wheels fitted. NB When purchased without bindings, these are supplied unassembled and assembly instructions are not provided. NB These are supplied fully assembled and with bindings fitted. The greater than usual cost with bindings reflects the extra time taken to assemble the ski and fit the bindings. Advaned skating multi-terrain rollerski, with 1x calf brake fitted. Excellent range of foot adjustment, used with your own running shoes. NEW Upgrade to the Rottefella Rollerski NNN binding. Available for classic, skating and combi rollerskis (for combi roller skis we will fit the skating binding). More info. Upgrade your bindings to the Salomon Pilot Carbon RS or RS2 bindings. The Pilot Carbon RS binding is the lightest Pilot binding available, with the lowest profile for optimum performance. The RS2 has a plate either side of the ridge, giving more protection to the base of the rollerski. For more info see - RS | RS2. Upgrade to the Rottefella Xcelerator binding. We will fit the Rottefella Mounting Plate and attach the bindings for the specified shoe size. Available for classic, skating and combi rollerskis. More info. For v8 LIFT Cross & Speed rollerskis. For for Skike v7 FIX, v8 rollerskis. 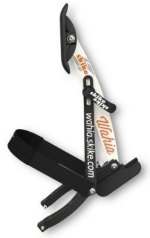 For Skike v7 FIX, v8 rollerskis, includes one-way 'reverse lock' ratchet mechanism. 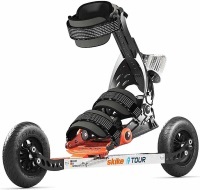 For Skike R8 Nordic rollerskis only, includes one-way 'reverse lock' ratchet mechanism. Replacement wheel for Skike VX Twin and Solo. Comes with regular bearings, but you can easily transfer ratchet bearings from existing ratchet wheels. Designed to change tyres of 125mm and 150mm. Makes it considerably easier to remove tyres and get to the Inner tube. Converts regular Skike wheels into ratchet wheels, easy to replace bearings which can be easily pushed in and out. One required per wheel, normally only fitted to the front wheels. 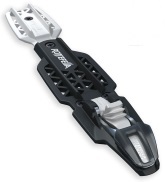 Braking device for Powerslide X-Plorer and X-Trail rollerskis. Mudguards for Powerslide X-Plorer Skating and X-Trail rollerskis. Set of 4. Mudguards for Powerslide X-Plorer Classic front wheels (not possible to fit on back wheels on X-Plorer Classic skis). Set of 2. Standard replacement wheel, for with Powerslide X-Plorer and X-Trail rollerskis. SKIKE WARRANTY INFORMATION: All Skikes are supplied with a unique 'RFID' number and card. You should keep this in case of any warranty issues. Warranty claims are best dealt with through the Skike website. You can register an acount and submit a warranty claim here - http://www.skike.com. We will always help if you have any issues with this process. In our experience Skike deals with claims quite efficiently. Bindings note: we attach the bindings to the rollerskis for your convenience. To mount certain bindings correctly we need to know the shoe size you will be using with the skis. If you plan to use different shoe sizes with the skis, let us know the largest. For bindings upgrades see here.